As the need for English vocabulary grows, it becomes imperative to make your children learn about how suffixes can help in forming new words. 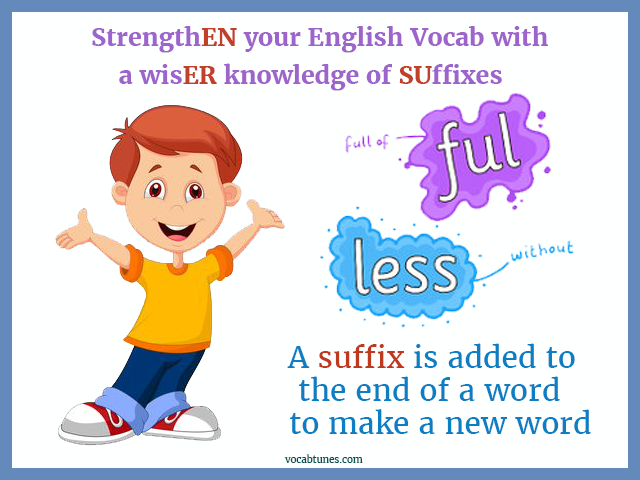 Now, you may ask what exactly is a suffix? It is nothing but a morpheme (the smallest grammatical unit that can’t be further divided) that is added right at the end while spelling the word to derive a special meaning out of it. So, when Popeye ate spinach he became strongER, which means he became more strong and his muscle popping through the shirt showed that he was the strongEST as he gained most strength. When the animals in Madagascar crash land in Africa; they find the view by the river beautiFUL, which means the place is full of beauty. Similarly, they find the monkeys quite useFUL in mending the broken plane. In the animatION movie ‘Boss Baby’, the lead character enters the Templeton household to save Baby Corp from a problematic situatION, which means they are in the state of a problem. Quite similarly without the constant flow of the secret baby formula, the boss baby’s conditION worsens and he starts to act as a normal baby. If you have watched ‘Jungle Book’, you will find that Shere Khan threatENs Mowgli since his inception in the jungle. The word ‘threat’ when suffixed with ‘en’ becomes the act of scaring somebody. In a similar manner, when Mowgli learns of wolf pack leader, Akela’s death, his fury awakENs and he sets out to confront Shere Khan on his own. In ‘Tom and Jerry’, the domestIC cat, Tom, keeps on chasing Jerry and their antics make this cartoon series hilariously comIC. ‘Domestic’ means relating to home and ‘comic’ pertains to comedy, therefore the suffix ‘ic’ means pertaining to. Combining these suffixes with root words, Vocab Tunes, the unique online reading program has structured 21 songs, which will help your kid to learn vocabulary in a fun manner. These songs are easy to memorize, therefore it would be easier for your child to relate to them at the time of practical usage. Along with increased word knowledge, this learning program also helps to improve English scores.